Most of you know that I mainly use samples and miniatures when preparing my Reviews. At the request of many of my readers I give preference to more recent expressions. As a result, my backlog of older samples has increased quite a bit. To do justice to those samples I will review them in the format of Specials. These specials will deal with a specific distillery like today or with specific bottlers, countries or regions. The reviews in these Specials will concentrate on the Whisky and won't touch too much details about distilleries, maturation etc. I do hope you will like these Specials just as much as my regular reviews and I look forward to your reactions and suggestions. 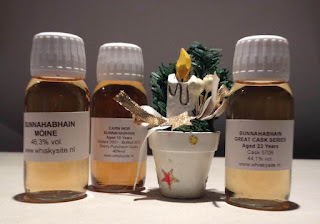 In this special I will review three random Bunnahabhain Single Malts. Enjoy! Maturation: Info not available. 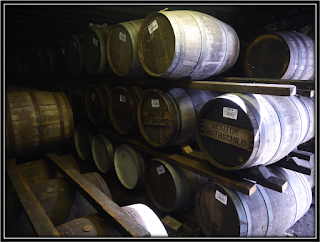 Most likely mainly Ex Bourbon Casks. 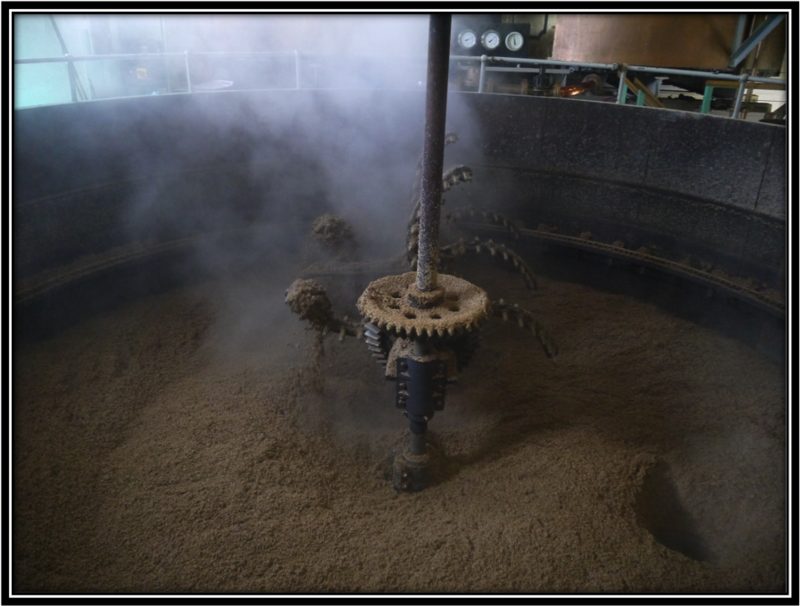 Typical Young Peated Islay Malt. Ardbeg and Port Ellen come to mind. It's young Whisky but the overall Aroma is true to form and not unpleasant. Toasted Cereals, Buttered Toast, Coastal Peat, Cold Smoke, Fresh Flowers and Herbs, Green Apple, Pear, Lemon, Grass/Straw, Salted Nuts, Ashes, Tar, Soot, Brine, Iodine, Diesel, Pepper and Menthol. Heather Honey, Caramel, Toffee, Red Berries, Banana, Nail Polish and Leather. Young, slightly Edgy and Light. The Alcohol is quite present. Peat, Smoke and Herbs take the lead. Toasted Cereals, Yeast, Grass and Straw, Coastal Peat, Cold Smoke, Tar, Ashes, Soot, Iodine, Diesel, Pear, Green Apple, Cocoa Powder, Grapefruit, Licorice, Pepper, Ginger, Menthol and Fresh and Dried Herbs. Caramel, Honey, Smoked Fish, Salted Nuts, Lemon, Leather, Cinnamon, Nutmeg and Cloves. Middle-Long and mainly Sweet. Some Sour notes provide balance. The Alcohol is quite noticeable and a little Sharp. The Finish is the weaker part of this Moine. I find Toasted Cereals, slightly Burnt Toast, Yeast, Salted Butter, Cold Smoke, Wet Earth, Tar, Soot, Ashes, Iodine, Pear, Heather-Honey, Fresh Herbs, Soap, Mushrooms, Sugar, Lemon, Grapefruit Juice, Cocoa Powder, Pepper, Menthol, Leather, Licorice, Wet Rocks, Diesel and a light Metallic note. I added a few drops of Water and that helps to calm down the Alcohol. It becomes dangerously drinkable this way so be careful! Personally I prefer it neat but you can certainly add a few drops of Water as per your preference. Bunnahabhain was founded in 1881 by William Robertson and is located close to Port Askaig on the isle of Islay. It is now owned by Distell International Ltd who are looking to give the distillery a much needed face lift that will be ready in 2019. 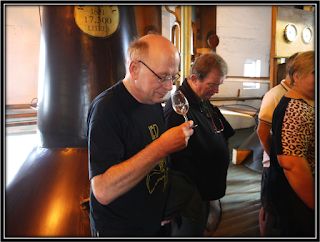 The core range now includes the 12, 18, 25 and 40 years alongside some peated expressions like the Toiteach. Total production is around 2 million litres of which 35% is peated. The Moine (Gaelic for Peated) was launched in 2015, initially only for Sweden. There are a few other Moines around that are finished a.o. in Oloroso & Brandy casks. The Moine I'm reviewing today is young and not at all complex but true to form Islay. The Price/Quality ratio is good despite its limited age. Bunnahabhain is increasing their peated Single Malts and perhaps rightly so. If you like young peated Islay Whisky, this is a good alternative. Price Range: Around US$ 50 (January 2019) - Hard to Find! Young, Medium-Light and Sweet. Sherry dominates the Nose with lots of Dried Fruit. No surprises here but no off-notes as well. The Alcohol is noticeable. Sweet Barley, Buttered Toast, Brown Sugar, Salted Caramel, Fruitcake loaded with Dried Fruits like Raisins, Sultanas, Apricots and Figs, Plum Jam, Orange, Sweet Apples, Straw, Cinnamon and Cloves. Heather-Honey, Vanilla, Butterscotch, Pear, Lemon, Grapefruit, Cocoa Powder, Coconut, Green Coffee Beans, Menthol, Cured Ham and Leather. Young, Sweet and a little Thin despite the adequate ABV. The Sherry cask still rules. The relative Youth of the Spirit is more noticeable now. Sweet Barley, Salted Caramel, Brown Sugar, Dried Fruit like Raisins, Sultanas, Plums, Dates and Figs, Orange, Sweet Apples, Almonds, Milk Chocolate, Cloves, Pepper and Cinnamon. Heather-Honey, Cherry-Flavoured Cough Syrup, Espresso, Cardamom, Leather, Tobacco, Menthol and a few Mineral notes. Middle-Long and Sweet with an increasing Bitterness towards the Dry end. A little Sharp still on account of its relative youth. The Sherry is the dominating factor right to the very end. I find Toasted Cereals, Salted Caramel, Vanilla, Dried Fruit like Raisins, Sultanas, Figs and Plums, Grass/Straw, Salted Almonds,, Milk Chocolate, Honey, Red Apples, Dried Herbs, Cinnamon, Pepper, Cardamom, Menthol, Tobacco and Leather. A light Metallic note right at the end. This Bunnahabhain does not accept added Water very well. Better sip it neat! This is a rather young Whisky but the active Sherry cask and the adequate ABV succeed in masking this fact, especially on the Nose. On the Palate and in the Finish this Bunnahabhain feels a little Thin but is never unpleasant. It's too Thin to consider it a Sherry Monster but if you like Sherry-Finished unpeated Malts you can't go wrong with this Bunnahabhain, also because of the favourable P/Q ratio. The two Bunnahabhains I have tasted so far during this session show that this Distillery can easily handle both peated and unpeated Single Malts. Buying Advice: 😐The P/Q ratio is Okay. Disappointing for a 23 Year old Malt. Quite Light and Fresh for a 23 Year old Whisky. Cask # 5706 was not a very active one if you ask me. On the Nose this Bunnahabhain presents a combo of Fruity, Floral, Herbal and Mineral Aroma with a light touch of Coastal Peat. The Alcohol is still noticeable. Please give this Malt enough time in the glass before Nosing as it does not give itself away very easily. Patience is needed! Sweet Barley, Buttered Toast, Salted Caramel, Toffee, Wet Sand, Grass, Green Apple, Pear, Orange Juice, Fresh Herbs, Floral Soap and Cinnamon. Heather-Honey, Coastal Peat, Charred Oak, Vanilla, Milk Chocolate, Mandarin, Lemon, Varnish and Menthol. Again a bit on the light side given its age although the Wood influence is more clear now. It's a bit Dusty as well. Sweet but no overly so. Quite Dry after a few seconds. A mix of Fruity, Floral, Herbal, Mineral and Spicy notes. Toasted Barley, Salted Caramel, Green Apple, Pear, Nectarine, Fresh Herbs, Floral Soap, Grass, Orange, Pepper, Ginger and Licorice. Heather-Honey, Vanilla, Nuts, Coastal Peat, Wet Sand and Rocks, Lemon, Oak Char, Old Books on Dusty Shelves, Leather, Aniseed, Nutmeg and Caffe Latte. Middle-Long, Sweet and Spicy with a light Bitterness towards the very Dry end. The Oak is more noticeable now. Still a bit of Alcohol despite all these years! I find Sweet Toasted Barley, Toast, Salted Caramel, Grass, Heather-Honey, Nuts, Green Apple, Orange, Lemon, Pepper, Ginger, Nutmeg, Cardamom, Licorice and a bit of Coastal Peat and Charred Oak. I added a bit of of Water and Citrus notes develop strongly on the Nose. Palate and Finish do not change in a significant way but you can carefully add a drop of Water if you like. Good but I expected more of a 23 Year old Whisky. 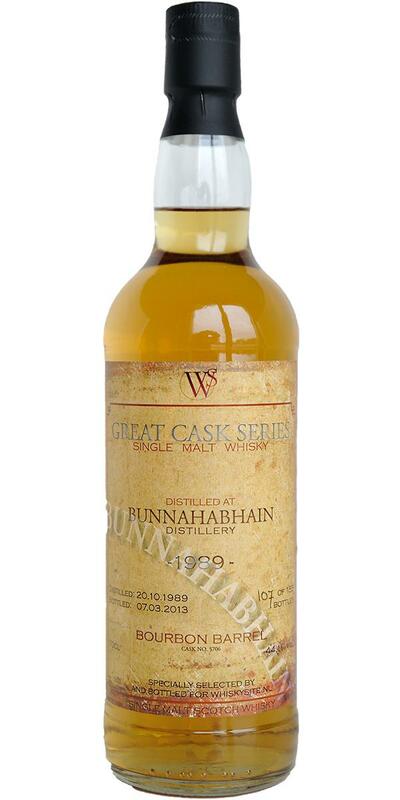 This Bunnahabhain was distilled on October 20, 1989 and bottles for Whiskysite, The Netherlands on March 7, 2013. It's not a bad Single Malt but I must admit I expected more of a 23 Year old Whisky distilled in the late Eighties. Somehow it misses balance. It does not help as well that the Cask was little active. After I finished the Tasting session and included the score in my Complete Ranking Of Reviewed Whiskies I noticed I already had reviewed this Bunnahabhain back in 2014. You can find the earlier Review here. I was happy to see that my reviews were quite in line and presented an almost identical score. This completes today's little Bunnahabhain Special. All three Single Malts were okay but none of them were exceptional. I would like to wish all my readers and their families Good Health and Happiness in 2019. Thanks very much for your ongoing interest and support! Let's see if we can reach around 900 reviews by the end of this year! Price Range: US$ 250-600 (December 2018). Will be very hard to find. The ABV is quite substantial so be sure to give this Aberfeldy enough time in the glass. This Single Malt looks and smells like Christmas. A true Sherry-Bomb with lots of Dark Fruit, Spices and Leather. Quite Sweet and a little Dusty. Compact and Mature. Significant Cask influence. Sweet Barley, Buttered Toast, Salty Caramel, Treacle, Brown Sugar, Dried Fruit like Sultanas and Raisins, Resin, Peach, Nectarine, Orange, Bitter Chocolate, Polished Leather Upholstery, Straw, Dusty Oak, Cinnamon and Ginger. Toffee, Vanilla, Rum, Dark Honey, slightly Sour Berries, Lemon, Marzipan, Dark Cherries, Tobacco, Pepper, Licorice, Dried Herbs and Menthol. Sherry, Sherry and Sherry! On the Palate, this Aberfeldy is Bitter-Sweet & Dry. The Oak is quite present. Toasted Barley, Salted Caramel, Brown Sugar, Treacle, Dried Fruit like Raisins, Sultanas and Plums, Dusty Oak, Oranges, Dark Chocolate, Resin, Polished Leather Upholstery, Tobacco, Cinnamon and Ginger. Christmas Cake, Slivovitz, Lemon, Dark Cherries, Nectarines, Herbal Tea, Strong Espresso, Pepper and Nutmeg. Middle-Long and Bitter-Sweet. The Bitterness increases towards the Dry end. Cask # 5 certainly left its mark on the Aberfeldy Spirit. I find Sweet Barley, Salted Caramel, Toffee, Brown Sugar, Treacle, Dried Fruit like Sultanas, Raisins and Plums, Orange, Marzipan, Almonds, Dusty Track, Oak, Dried Herbs, Ginger, Cinnamon, Pepper, Nutmeg, Licorice, Tobacco and Menthol. A few drops of Water help to calm down the Alcohol. Palate & Finish become slightly more Herbal but in this case my advice is to add a few drops. The Aberfeldy distillery is located in Aberfeldy (Perthshire) in the Southern High-lands. It was founded in 1896 by John and Tommy Dewar. The needed a Single Malt for their blended Whisky Dewar's White Label. Since 1998 it is owned by the Bacardi Group. A beautiful visitor centre was opened in 2002. The annual production amounts to around 3.5 million litres. The core ranges consists of the 12, 16 and 21 Years Old. 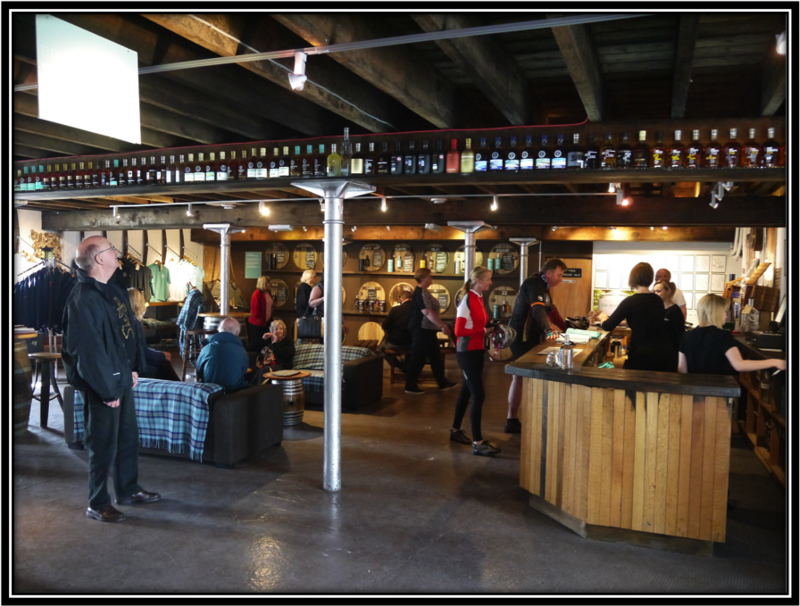 We visited the distillery and the beautiful visitor centre in May 2017. That's where I bought the 17 Years I'm reviewing today. This is by far the best Aberfeldy I have tasted until now. Sherry Bomb fans will love this one and I will certainly serve this Single Malt with Strong Coffee and Rich Dark Chocolate at the end of this year's Christmas Dinner. At the same time I feel that the Spirit stayed a few years too long in the very active Cask # 5. The Wood influence is a bit overwhelming at times. But it's a quality Whisky without any doubt and it's certainly worth the 100 Pounds or so I paid for it at the distillery. There won't be many bottles left though and I've seen crazy prices of over US$ 500 on the internet. That's way too much for this Aberfeldy. Limited Editions like this should be bought at the distillery as soon as they are available. 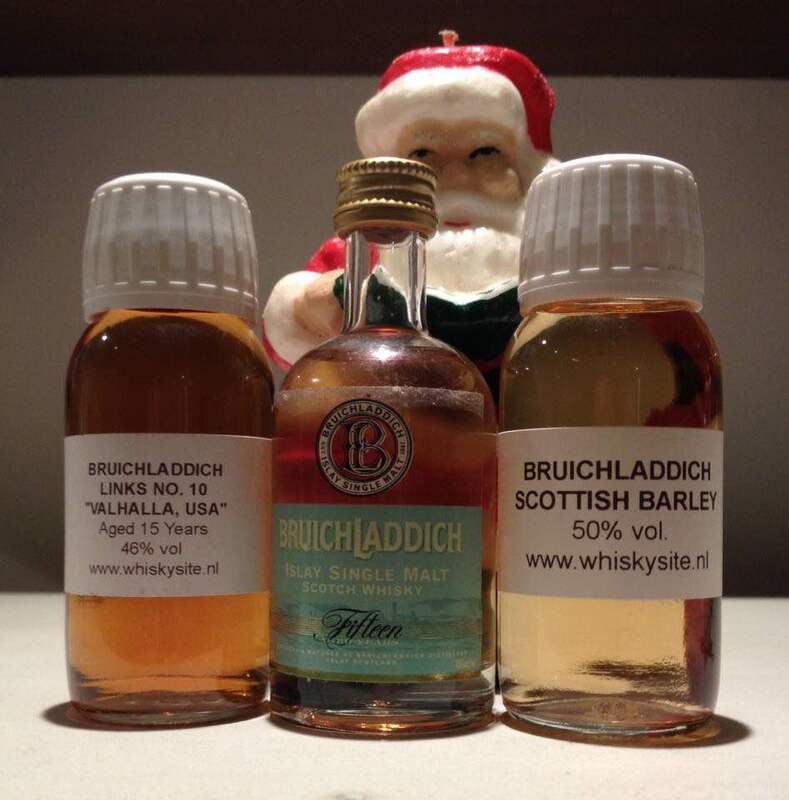 Dear Whisky friends, I would like to wish you and your family a very Happy and Malty Christmas. May the Spirit be with you all! Most of you know that I mainly use samples and miniatures when preparing my Reviews. At the request of many of my readers I give preference to more recent expressions. As a result, my backlog of older samples has increased quite a bit. To do justice to those samples I will review them in the format of Specials. These specials will deal with a specific distillery like today or with specific bottlers, countries or regions. The reviews in these Specials will concentrate on the Whisky and won't touch too much details about distilleries, maturation etc. I do hope you will like these Specials just as much as my regular reviews and I look forward to your reactions and suggestions. In this special I will review three random Bruichladdich Single Malts. Enjoy! Buying Advice: 😬Interesting but not flawless. Price/Quality ratio: Okay. Quite Sweet and a little Thin. The Sherry influence is noticeable. Dried Fruit and Fortified Red Wines call the immediate attention. There are a few Sour and Salty notes as well. Nothing very complex. The tiniest hint of Smoke. Unfortunately, the Alcohol is not fully integrated. Sweet Barley, Butterscotch, Vanilla, Salted Toffee, Dried Fruit like Apricot and Apple, Pineapple, Red Berries, Orange, Grapefruit, Banana, Mint, Milk Chocolate, and Cinnamon. Heather-Honey, Dough, Floral Perfume, Lemon, Tangerine, Coconut, Dry Earth and Wood-Shavings. Bitter-Sweet and a little Edgy. A few Sour notes as well. Musty & Dusty! Not a lot of complexity though. Toasted Barley, Salted Caramel, Dried Apricot, Nuts, Grass, Red Grapes, Melon, Banana, Orange, Grapefruit, Dusty Oak, Pepper and Menthol. Toffee, Vanilla, Heather-Honey, Pineapple, Tangerine, Coconut, Red Berries, Wet Rock, Dusty Track and Ginger. Middle-Long, a little Sharp and Bitter-Sweet. Medium-Dry, a bit Edgy and Old-Fashioned. A metal off-note is clearly noticeable towards the end. I find Toasted Barley, Dry Earth, Salted Caramel, Toffee, Vanilla, Butterscotch, Dried Fruit (Apricot) and Nuts, Grass, Red Grapes, Orange, Grapefruit, Apple, Bitter Oak, Pepper, Ginger and Menthol. I added a few drops of Water and that relaxes the Spirit. Lots of Barley & Citrus. The Finish gets even more Menthol this way. You can carefully experiment with a few drops at a time. Good. Quite straight-forward and a little Dusty. Bruichladdich was founded in 1881 by Barnett Harvey. During its history it was mothballed various times, the last time in 1998. 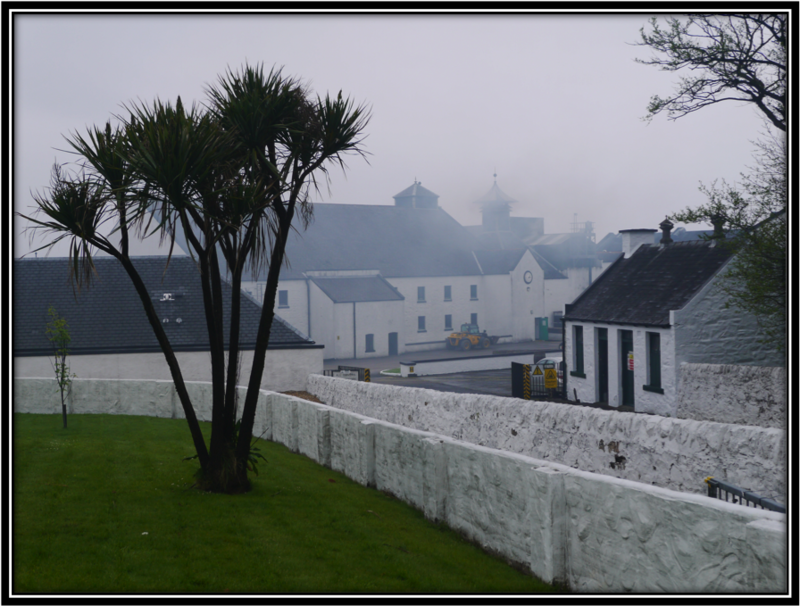 In 2012 the Islay distillery was bought by Remy Cointreau (France). 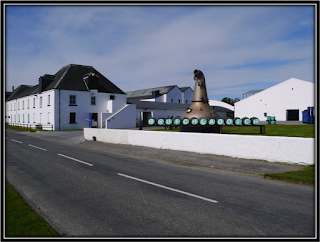 Since, Bruichladdich is showing a healthy growth again. The distillery produces 3 types of Single Malt, i.e. the unpeated Bruichladdich, the heavily peated Port Charlotte and the very heavily peated Octomore. 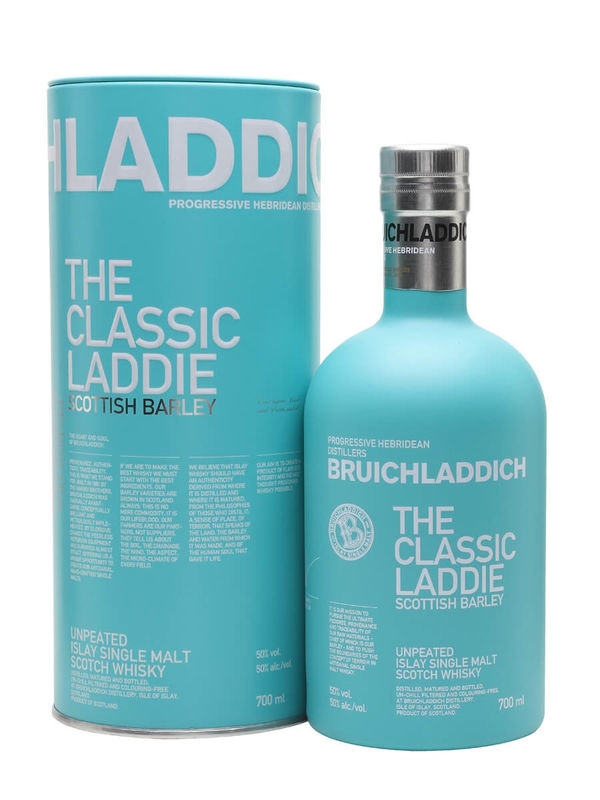 The basic core range for Bruichladdich includes The Classic Laddie, Islay Barley 2010 & Black Art 5. The 15 Years I'm reviewing today was launched in 2003. 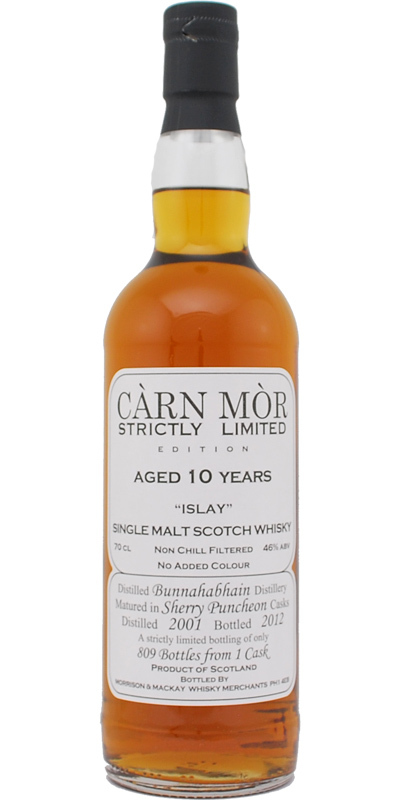 I bought a miniature on Islay during my visit in 2014 that was bottled 1 to 2 years earlier. This 15 Years is known as the 1st Edition. The 2nd Edition was partly matured in sweet Sauternes Whine casks from France. The First Edition is still available in places. The 15 Years 1st Edition is a simple and straight-forward "Old-Fashioned" malt. It has not been "prepared" for the big markets. There are a few rough edges and the Finish suffers from the Metal off-note. It's a bit on the light side for a 15 Year old Whisky. I kinda like this style but I feel that a little more care during distillation and maturation could have produced a much better 15 Years. A bit of a missed chance I'm afraid. Still, sufficiently interesting and not too expensive if you can find it at around US$ 75. Buying Advice: 😊Good interesting, old-fashioned, stuff. Quite expensive! Full, a bit Heavy and Sweet. Please give it enough time in the glass before you start Nosing as the Alcohol is quite noticeable. The Sauternes influence is very obvious. It smells almost like a Whisky Liqueur. This Valhalla will certainly bring your Nose in the Christmas mood. There are many Sherry Monsters around but this Bruichladdich comes close to being a Sauternes-Monster! Sweet Barley, Buttered Toast, Golden Syrup, Dried Fruit like Raisins, Sultanas, and Apricots, Nuts, Yeast, Orange, Peach, Tinned Pineapple, Cinnamon & Dusty Oak. Brown Sugar, Vanilla, Marzipan, Sour Grapes, Floral Perfume, Forest Soil, Dusty Track, Honey, Sweet Apples, Nectarine, Pepper and Ginger. Chestnuts roasting on an open fire! I don't actually taste Chestnuts but the X-mas feeling to this Valhalla is crystal clear. Again a little on the Heavy side but comforting nevertheless. I'm tasting Valhalla while temperatures in Sao Paulo today have reached 34 Degrees Celsius. I perspire but still manage to imagine Christmas! Sweet Barley, Golden Syrup, Dried Fruit like Apricot, Raisins and Papaya, Sour Grapes, Red Apple, Orange, Peach, Cinnamon, Pepper, Cocoa Powder, Oak and Menthol. Honey, Brown Sugar, Vanilla, Sweet Almonds, Pineapple, Lime, Pear, Nutmeg, Ginger and Leather. Good Length. Dry with Sweet, Bitter and Sour notes. The Bitterness increases towards the end. I find Sweet Barley, Sauternes, Dried Fruit like Apricots and Papaya, Sour Grapes, Red Apple, Orange, Lime, Pepper, Nutmeg, Ginger, Dusty Track, Menthol, Oak, Dark Chocolate and Leather. I added a little Water and the Peach develops on the Nose. The overall Aroma and Flavour profile does not change a whole lot but the Valhalla certainly will accept a few drops of Water. 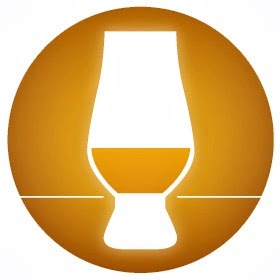 The Bruichladdich Links series was released in 2003. The Tins and Labels show a number of famous Golf Courses painted by Graham Baxter. The Valhalla I'm reviewing today was # 10 in the series. The Label shows a reproduction of the 13th Hole of the Valhalla Golf Course in Kentucky (USA) that hosted the Ryder Cup in 2008. Valhalla was finished in casks that previously held Chateau Climens, a Premier Cru Classe Sauternes wine producer from Barsac in the Southern part of the Bordeaux region. The grape variety is 100% Semillon. In general I'm not the greatest fan of Wine Finishing but there are always a few exceptions and this is one of them. The Valhalla is not perfect and a bit Heavy and Dusty in places but the combination of the unpeated Bruichladdich and the Sweet Dessert Sauternes Wine of Chateau Climens seems to work. Valhalla is not your everyday to-go-to Single Malt but around Christmas time this Islay Malt will do just fine in combination with a Sweet Dessert. I'm sure the Viking warriors would please Odin in offering him a glass or two of this Bruichladdich in Asgard. Skal! Young and Edgy. The Alcohol is quite noticeable so be sure to give this Malt a lot of time in the glass before Nosing. The Nose is mainly Sweet but there are a few slightly Sour notes as well. There are some unwanted hints of Plastic Toys and Lemony Glass Cleaner. In that sense, the Scottish Barley is unique! Sweet Barley, Butter Kekse, Salted Caramel, Grass/Hay, Orange, Sweet Apples, Floral Perfume, Fresh Herbs, Menthol, Cinnamon and Oak. Vanilla, Honey, Lager Beer, Wet Sand, Tangerine, Raisins, Cherry Flavoured Candies, Pear, Pineapple, Nutmeg and Tobacco. Young and rather Sharp. The Alcohol is over the top here. Some Metallic and Rubbery Off-Notes. A mix of Sweet, Sour and Bitter tones. Toasted Cereals, Salted Caramel, Grass/Hay, Floral Soap, Sweet Apples, Fresh Herbs, Orange, Tangerine, Grapefruit, Grappa, Oak, Cinnamon, Pepper, Licorice and Menthol. Brown Sugar, Vanilla, Honey, Pineapple, Pear, Melon, Nutmeg and Tobacco. Short and a little Hot. The Alcohol is really present. This is without any doubt Young Whisky and there's a New Make Spirit/Grappa feel to the Finish. Mainly Sweet and Sour notes with increasing Bitterness towards the Medium-Dry end. I do find a light Metallic Off-Note as well alongside Toasted Cereals, Salty Toffee, Honey, Orange, Tangerine, Grapefruit, Lemon, Apple, Oak, Grass/Hay, Herbal Tea, Tobacco, Wet Sand, Rubber, Pepper and Menthol. I added a bit of of Water but the only positive effect is that the Alcohol burns less. Other than that you basically kill this Malt even given its high ABV. Scottish Barley was released in 2013 and it probably won't surprise you that it was created by Jim McEwan using 100% Barley from Scotland. 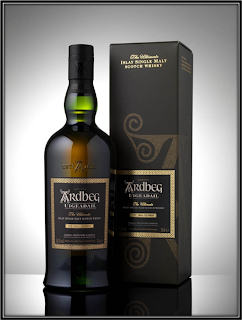 This unpeated Single Malt is said to have been matured in American Oak casks in warehouses directly situated alongside Loch Indaal, close to Port Charlotte. This is easily the weakest Bruichladdich I've tasted so far. The only remarkable feature is the striking turquoise-coloured bottle. Other than that this just Young Spirit that "matured" in indifferent Wood and received an unnecessary high ABV of 50%. And as the final result is a below-average Single Malt, nobody should care if it's made of 100% Scottish Barley or not. Back to the drawing-board please! This just isn't good enough! Most of you know that I mainly use samples and miniatures when preparing my Reviews. At the request of many of my readers I give preference to more recent expressions. As a result, my backlog of older samples has increased quite a bit. To do justice to those samples I will review them in the format of Specials. These specials will either deal with a specific distillery like today or with specific bottlers, countries or regions. The reviews in these Specials will concentrate on the Whisky and won't touch too much details about distilleries, maturation etc. I do hope you will like these Specials just as much as my regular reviews and I look forward to your reactions and suggestions. 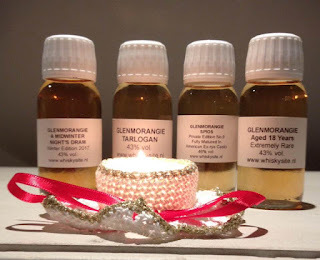 In this special I will review four random Glenmorangie Single Malts. Enjoy! Young and a bit Thin but very Fruity. Lots of Orange and Dried Fruit. I'm pretty sure some New Wood was used for maturation. The PX Finish certainly provided a little more depth. The Alcohol is noticeable. Quite Sweet but not in an annoying way. Sweet Barley, Butter Kekse (German Butter Biscuits), Dried Fruit like Raisins & Apricots, Caramel/Toffee, Orange, Sweet Apples, Banana, Walnuts, Cinnamon & Milk Chocolate. Heather Honey, Vanilla, Burnt Grass, Dusty Track, Red Berries, Mandarin, New Oak, Spiced Wine, Cigar Box, Wet Paper, Ginger, Cloves, Caffe Latte & Dried Herbs. Bitter-Sweet & rather Thin. 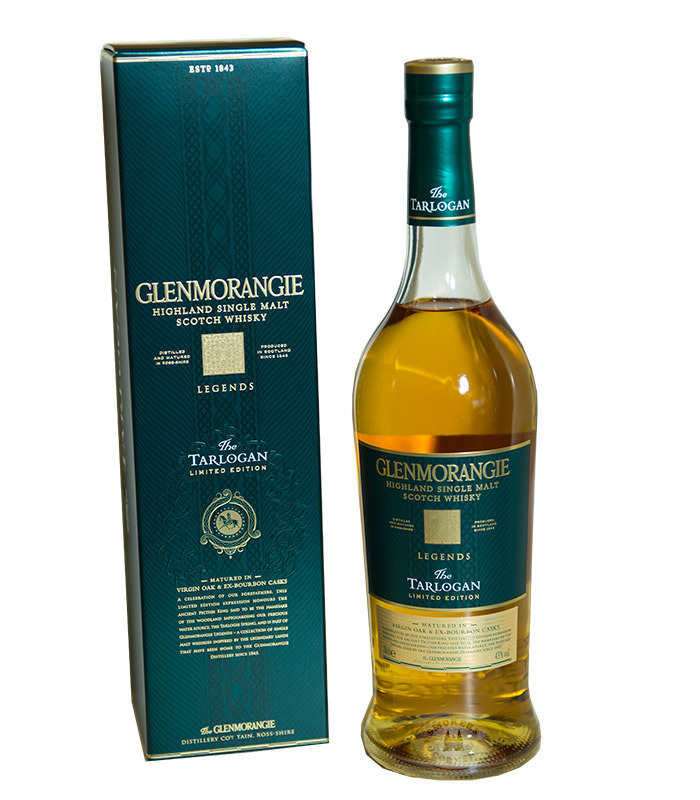 Despite the 43%, there is an unmistakable Watered-Down feeling to this Glenmorangie. A bit Dry towards the end. The Fruitiness of the Nose remains. This Fruitiness is the best part of this Glenmorangie. It's a Young Whisky and the Alcohol is noticeable. Sweet Barley, Toffee/Caramel, Brown Sugar, Dried Fruit like Raisins & Apricots, Orange, Banana, Nutella, Milk Chocolate, Cinnamon and Pepper. Vanilla, Treacle, Red Apples, Honey, Oak Char, Burnt Grass, Nutmeg, Ginger, Mint and Cloves. Middle-Long. Initially Sweet but with increasing Bitterness towards the end. A bit Watery as well. The relative youth of the Spirit becomes clear. I would not give it much more than 6-8 Years. After a while a Rubbery off-note appears. It is not really bad but I could do without it. I also find Sweet Barley, slightly burnt Buttered Toast, Toffee, Seville Orange, Dried Fruit like Raisins & Apricots, Peach Jam, Honey, Marzipan, Nuts, Milk Chocolate, Oak Char, Peanut Butter, Pepper, Ginger, Clove and Nutmeg. The Alcohol is quite noticeable here. This Glenmorangie does not accept added Water very well. Better sip it neat. 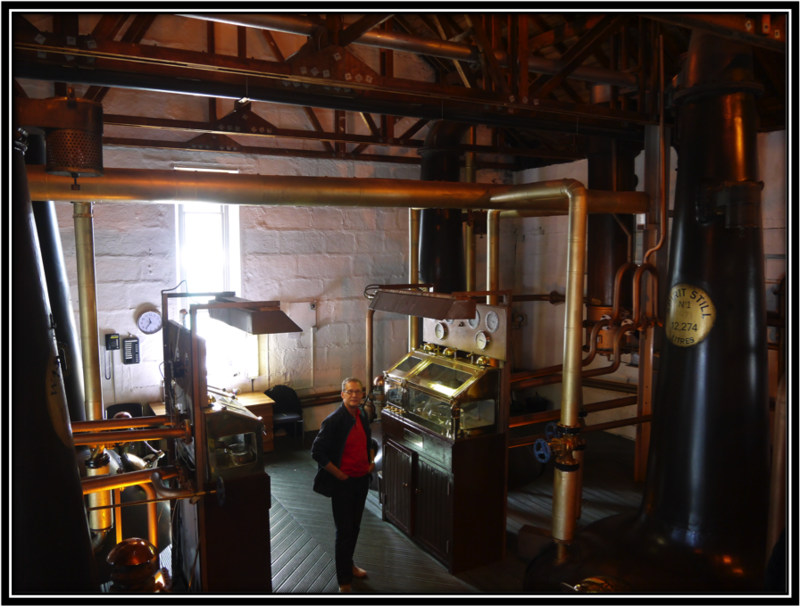 The production at this Tain based Distillery started in November 1849. By the end of the 1930's, the McDonald family took control of Glenmorangie. They only sold the distillery to Vuitton/Moet Hennessy in 2004. Since 1994, Glenmorangie has been very actively experimenting with different Wood Finishes. The current core range includes the Original 10 Years, the 18 years, the 25 Years, the Signet and three 12 Year old Wood Finishes i.e. the Quinta Ruban (Port), the Lasanta (Sherry) and finally the Nectar d' Or (Sauternes). 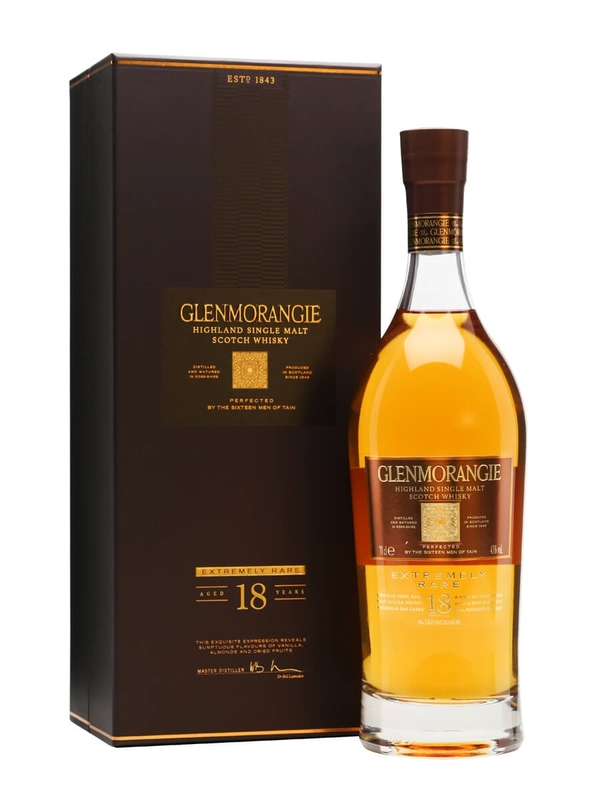 In the last years however, Glenmorangie launched a large number of Special editions and Travel Retail specials. Currently, around 5.5 million litres of Spirit are produced. 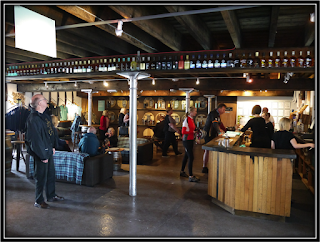 We visited the distillery in May 2017. The whole place looks impeccable and the Still House (Cathedral), VC and Shop are a true feast to the eye. It's almost a bit too polished for my personal taste. I'm more the Springbank type of guy! A Midwinter Night's Dram 2017 celebrates a long gone tradition at Glenmorangie where the staff (The Sixteen Men of Tain) were treated by the Master Distiller with a special Whisky during in the days before Christmas to show appreciation for their work during the year. 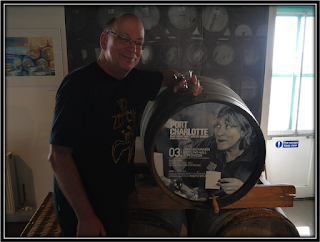 As usual, this Single Malt was created by Dr. Bill Lumsden. This is by no means a bad Single Malt despite its apparent Youth and it does remind me of X-mas time with all the Dried Fruit, Nuts and Spices. But if I had been one of the Sixteen Men of Tain back in the old days I would have asked the Master Blender if my hard work wouldn't have deserved a bit more punch! Because despite the nice Fruit, this Glenmorangie really makes a Watered-Down impression. And the weak Finish did cost it a point or so as well. As such, the price is also a tad too high. Young, Light, Floral and Green. The first thing I notice is the Virgin Oak. It's not one of my favourite Aromas as it tends to overpower other components. On the Nose, the Tarlogan is quite simple really. Not too much going on I'm afraid. Toasted Cereals, Caramel, Vanilla, Honey, Virgin Oak, Straw/Grass, Wax, Yeast, Unripe Pears and Green Apples, Orange, Banana, Pineapple and Bounty Bars. Burnt Toast, Dried Fruit like Raisins and Apricots, Butterscotch, Wet Leaves and Earth, Fresh Herbs, Varnish, Almonds, Cinnamon and Ginger. Bitter-Sweet, Light, Young and Edgy. There's an unfinished Feeling to this Malt. Almost like Work in Progress. Lots of Green and Unripe components. Toasted Cereals, Caramel, Vanilla, Bounty Bars, Honey, Cherry-Flavoured Cough Pastilles, Seville Orange, Unripe Green Apples and Pears, Floral notes, Virgin Oak, White Chocolate, Caffe Latte and Pepper. Butterscotch, Lemon, Banana, Papaya, Cinnamon, Nutmeg and Ginger. On the Short side and a bit Young and Nervous. Sweet at first but with a little Bitterness towards the end. The Alcohol is noticeable. I find Toasted and Malted Cereals, Vanilla, Almonds, Cherry-Flavoured Cough Pastilles, Raspberries, Oak, Caffe Latte, White Chocolate, Varnish, Dried Apricot, Pepper, Ginger & Nutmeg. The Green Apples return after a while. The Tarlogan does not accept Water very well. Better sip it neat. The Tarlogan was released in 2016, originally for Travel Retail only. It's part of the Legends series alongside the Duthac and the Tayne. It's named after the Tarlogie spring that is the mineral-rich Water source of the distillery since 1843. Tarlogan was a King of the Picts from 653-657. I don't want to go into history as the Eternal Enemy of Travel Retail Exclusives but hey, what can I do? The Tarlogan is another one of these nicely presented but ultimately Young whiskies that receive a Face Lift with Fresh Wood. I would not complain too much if this type of Single Malts was priced reasonably. But to ask around US$ 80 for such a Young Whisky is ridiculous. Just leave this stuff alone and buy the 10 Years Original if you're into Young Glenmorangie. Let's hope the two following expressions are better! Certainly different when compared to your average Glenmorangie Malt. The Rye is clearly noticeable but does not really convince. The Aromas are a bit too Light for that. On the Nose, the Spios is mainly Sweet and a little Dusty with lots of Herbal, Grassy and Buttery notes. Relatively Young and not very complex. Rye, Slightly Burnt Buttered Toast, Toffee/Caramel, Grass/Straw, Bread Dough, Orange and Mandarin, Banana, Dairy, Cherry-Flavoured Cough Pastilles, White Orchard Fruit and of course Spices like Nutmeg, Cloves and Cinnamon. Honey, Vanilla, Toasted Grains, Dusty Track, Nuts, Peach/Apricot, Aniseed, Mint and Licorice. Light, Relatively Young, Bitter-Sweet and quite Dry. Toasted Cereals, Rye, Toffee, Dough, Grass and Straw, Sour Berries, Orange, Banana, Red Apple, Cinnamon, Cloves, Nutmeg and Fresh Mint. Honey, Vanilla, Caffe Latte, Cocoa Powder, Green Tobacco Leaves, Aniseed and Herbal Tea and Dusty Oak Char. Light, Short and Bitter-Sweet. Quite Dry towards the end. I find Rye, Vanilla, Toffee, Butterscotch, Grass/Straw, Orange, Red Apple, Dusty Oak, Caffe Latte, Almonds, Cigar Box, Cocoa Powder, Dough, Sour Berries, Pepper, Cinnamon, Nutmeg, Cloves, Aniseed, Licorice and Menthol. A light Metallic Off-Note. I added a few drops of Water and the Nose becomes rather Floral. Quite some Citrus and perhaps Honey-Melon as well. Palate and Finish do not respond very kindly to added Water though. Better sip it neat! The Spios (Gaelic for Spice) was released this year as the 9th Limited Edition in the Private Edition Series. It is also the first Single Malt that matured a 100% in American Rye Whiskey casks. Dr. Bill Lumsden designed the Spios to honour America's Golden Whisky Era when Rye Whiskey ruled the saloons. He only used casks that had aged Rye Whiskies made from a 95% Rye Mash Bill during at least 6 years. 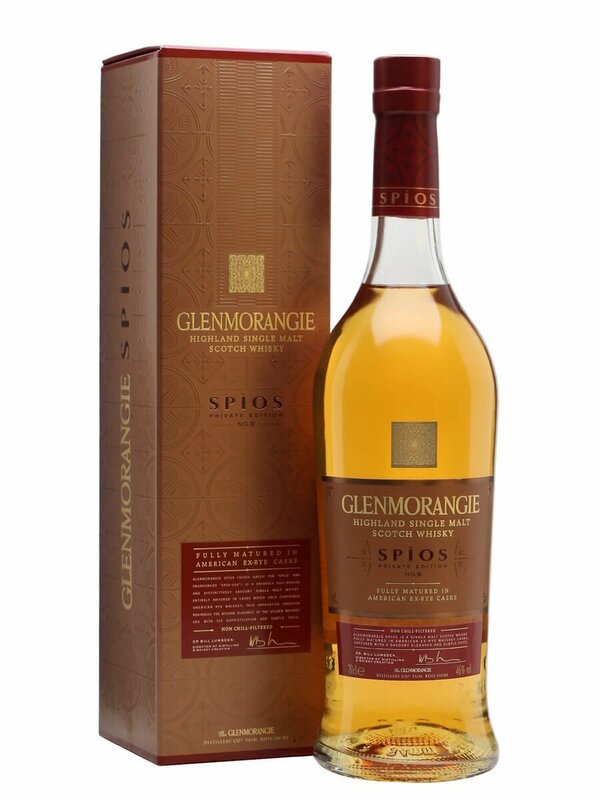 First of all I would like to congratulate Glenmorangie on the concept of the Spios. Without trying out new things we will never know what might have been. Having said that I must admit I was disappointed with the Rye cask maturation. I had expected a much stronger Spirit in the style of the American original. But it's all very light and harmless. A Diet-Rye so to speak. I can only imagine that more cask time could solve the issue. As presented it's not comparable to good Rye Whisky and it also doesn't highlight the qualities of the Glenmorangie Spirit. I'm yearning for a good Glenmorangie so let's hope the last one will do the trick. A combination of Sweet and Sour Notes with lots of (Dried) Fruits, Orange and Pastry. The Sherry influence is noticeable but not overwhelming. The ABV is not very high but the Alcohol is there nevertheless. The Nose is pleasant but a bit Edgy at the same time. Something I wouldn't have expected given the age of the Spirit. Is there some New Wood involved in the maturation? Could Be! The Nose is quite straight-forward and not very complex. Sweet Barley, Butterkekse (German Butter Biscuits), Butterscotch, Vanilla, Dried Fruit like Raisins, Plums and Apricots, Honey, Straw and Grass, Floral Perfume, Orange, Puff-Pastry filled with Peach Marmalade, Grapefruit, Nutella, Red Apple, Freshly Cut Wood, Cinnamon and Mint. Caramel/Toffee, Brown Sugar, Stewed Pears, Floral Tea, Gooseberries, Banana, Strawberry, Nutmeg and Ginger. A combination of Sweet, Bitter and Sour Notes. Quite Dry. The Wood appears more strongly now. A pity it was only bottled at 43%. An 18 Years old deserves at least 46%. That would have enhanced the Creamy character of this Malt. Sweet Barley, Butterscotch, Dried Fruit like Raisins, Figs, Apricots and Plums, Orange, Red Apple, Peach, Grapefruit, Milk Chocolate, Honey, Oak, Cinnamon, Nutmeg, Pepper and Menthol. Toffee/Caramel, Pear, Lemon, Banana, Papaya Cream, Blackberries, Tangerine, Nutella, Ginger and Cloves. A little Light and Medium-Long. Sweet and Fruity at first but with increasing Sourness and slightly Bitter Wood and Wood Spice towards the Dry end. The 18 Years shows its age here! I find Sweet Barley, Toffee/Caramel, Vanilla, Dried Fruit like Figs and Plums, Banana, Orange, Red Apple, Mandarin, Grapefruit, Dried Herbs, Milk Chocolate, Oak, Honey Glazed Nuts, Menthol, Cinnamon, Nutmeg, Ginger and Licorice. No need to add Water to this Glenmorangie although it does accept a few drops. Today, the 18 Years is part of the core range of the distillery. So it's not really Extra Rare! This is without any doubt my favourite of today's Glenmorangies. It's a well-made and pleasant Single Malt. A drinking Whisky rather than a sipping one. It has two main flaws though. The ABV is too low and that really hurts this Malt. This would be a great Whisky at Cask Strength! My second issue is the fact that it's quite simple for an 18 Years old. I would have expected a bit more complex Aroma and Flavour profile. Still, it's a nice Single Malt and reasonably priced when compared to other Malts of this distillery, especially those that carry Gaelic names and started their career in Travel Retail😜!